Collective Action on Water – To What End? The United Nations has designated 2013 as the International Year of Water Cooperation, which highlights the critical importance of cross-sectoral collaboration in promoting sustainable water management. But just to make an obvious point, public-private water stewardship partnerships are not about collective action simply for the sake of collective action; they’re about jointly tackling shared water challenges. And the highest priority ones at that. In recent years, companies are beginning to think more systemically and strategically about with whom and on what water issues they look to engage in a collective action context. The $2 billion dollar question (conservative estimate) becomes: are the other two segments of society – public sector and civil society – doing the same? When looking at companies’ public disclosures related to water, we often see that company actions are addressing an incredibly wide range of water-related challenges, including inadequate infrastructure, poor catchment governance, potential impacts of climate change, neighboring community access to clean water, upstream riparian restoration, and others. Such programs demonstrate that while water use efficiency and pollution abatement measures are certainly a critical component of corporate water stewardship, they simply are not and cannot be the complete picture. This is evident when you look at the unique complexity that underpins the water challenges companies face. For instance, there are many places around the world with abundant water resources (think large swaths of Latin America or Southeast Asia), but where governments simply do not have the capacity to deliver clean water reliably, manage the impacts of storm events, and where communities may not have the means to access the water they need. What would company operational water performance improvements mean in these contexts? Indeed, corporate leaders on water have come to the realization that water management efforts within the confines of the factory fencelines alone can’t address the water risks they face and they are taking a much broader approach to their water risk mitigation strategies. These approaches increasingly look not only to minimize the adverse impacts of corporate operations on water resources by promoting water use efficiency and improved wastewater treatment, but also to actively engage external interests to jointly address the complex landscape of water challenges that reside outside their fencelines. Such joint efforts to address shared risks include advocating for more sustainable and effective water policies, sharing knowledge and data, facilitating community access to water access and sanitation services, improving climate resilience, and many more. The CEO Water Mandate’s newly release Guide to Water-Related Collective Action provides step-by-step guidance regarding how companies can design and implement such collaborative approaches in a way that is both strategic for the company, and also addresses the underlying drivers of water-related problems affecting a wide array of stakeholders. A critical part of this guidance is assisting companies and those with whom they collaborate to develop a shared understanding of the drivers and manifestations of the water-related challenges the face. This, in turn, will allow the parties to scope the collective action around objectives that will derive shared benefits. 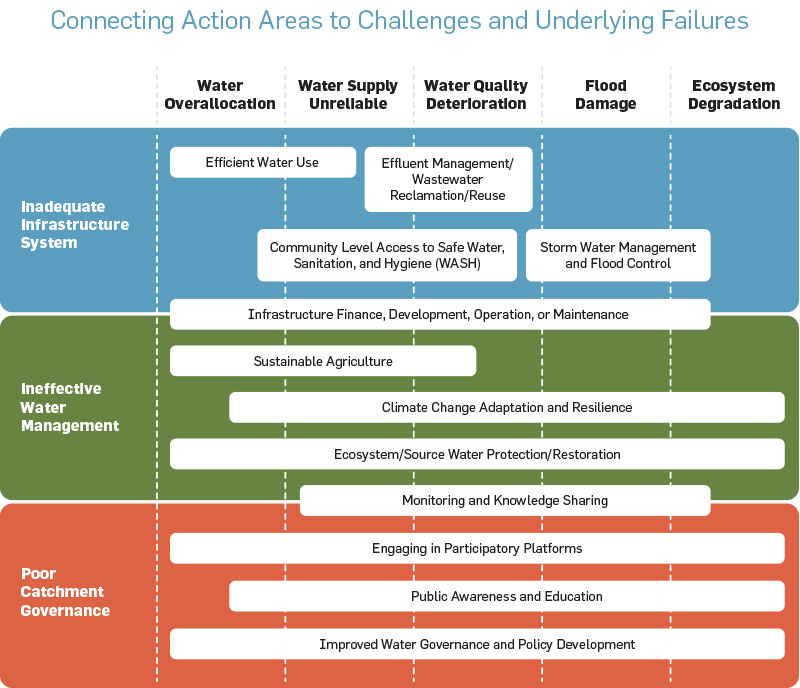 The schematic below is a tool the Guide puts forth that allows the company to map acute water challenges and their underlying drivers with the collective action responses that can prospectively address them. This decision framework was developed primarily for businesses, particularly those confronting the collective action imperative in a given geography and that are looking to embark on a collective action project in the most efficient and effective manner possible. Our question now is: Does this model align with how businesses’ potential partners, such as government agencies, civil society groups, and academia, understand these challenges and the steps needed to address them? Does it provide a solid footing with which to begin achieving consensus on how water-related problems at a local level can be solved to the benefit of all? Pacific Institute Insights is the staff blog of the Pacific Institute, one of the world’s leading nonprofit research groups on sustainable and equitable management of natural resources. For more about what we do, click here. The views and opinions expressed in these blogs are those of the authors and do not necessarily reflect an official policy or position of the Pacific Institute.